A book to help 11-14 year-old girls become excited about living for Jesus in every relationship in their lives. My daughter (age 10) is reading this with 2 of her friends, and they seem to be enjoying it and finding it helpful! She says it's easy to relate to and that it's making a difference to them. I bought this book when my daughter started High School. She has really enjoyed reading it. She said it has been really helpful. It is written in. Positive and accessible style and is not at all patronising to young people. A must read! Thanks Sarah for this helpful addition to my Youth Ministry Library here in Australia. "True" is solid but accessible, hard hitting but warm, challenging but also comforting, theological and yet very personal. A great read for all young women. I bought this to use with teenage girls at church. It supported the theme for our 'weekend away' brilliantly and was a really helpful aide. You never know what to expect when you buy online, but this book is brilliant. I was really impressed with how well it had been thought out and the content is great. The short discussion points/study elements at the end of each chapter really help reflection and were great for a group. There is a clear emphasis on scripture and it's written with a refreshing honesty, whilst keeping it about Jesus and not the author. It's also very well designed which makes you (and more importantly teenagers) want to read it! You can probably see why, once I'd 'proofread' a copy I had no hesitation in buying one for each of the girls in the group! I have just started reading this 1 to 1 with a young person. What a fab book! I love the mix of real life stories, practical tips and a great Bible study to ground it all in. The very natural conversational and relaxed style of the book makes it very easy for young people to read. Not just your average teen advice book but really encourages 11-14s to think about applying God's word to each area of their lives. 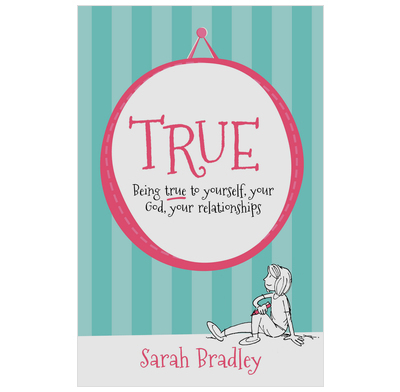 Have just finished reading 'True' and was really impressed with the clear way in which it is written and the godly wise advice it gives. Brilliant and completely on target for this age group! It was really helpful and encouraging. I twas really challenging and was really relevant to me!!! I bought it today and read it straight away, it was really encouraging and challenging and felt so relevant to me!!! I think True is an amazingly encouraging book. It really supports and helps me when I am struggling as a Christian and it's a great thing to read at night with my mum. I have tried some of the suggestions about living as a Christian and they have proved quite effective! I now have a non-Christian friend coming to a Christian club - I am really glad she has taken an interest. Thank you so much for writing True, I have given it to many friends and they are finding it helpful as well!